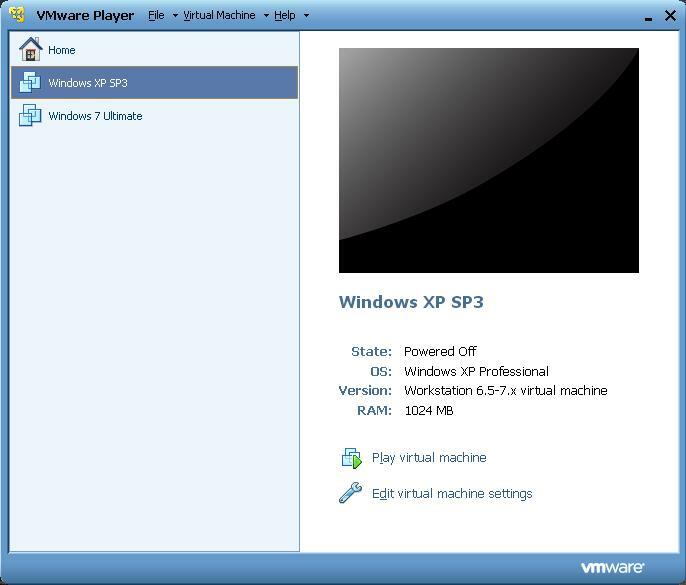 So you’ve been given a pre-configured VMware image of Windows XP and a copy of VMware Player for your work environment. The considerate IT intern who probably configured your VMware image has no idea what you do day in and day out, let alone what tools you need in order to get your job done. They know that there is 4.7GB of space to work with on that DVD to cram your VMware image onto. So end up with a Windows XP guest OS with only the latest version Office loaded on there. All of that will fit on there only 10GB preallocated for your virtual hard disk and leave 5-6GB of space, easily. When you are done getting everything tweaked and configured just the way you like it, you find that you have only 200MB of space remaining. After all, the space requirements for your ETL software, database development software, database documentation, and other utilities add up. 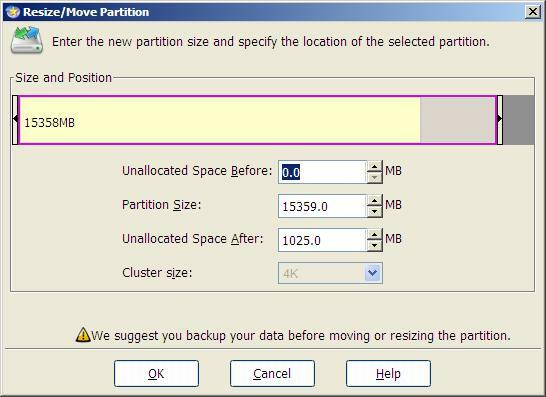 This guide will show you how to expand the size of your VMware virtual hard disk and allocate that additional space to the partition in the guest OS. BACKUP of your VMware image. Guest OS will need at least 75MB of free space. Download a copy of EASEUS Partition Master Home Edition in the Guest OS. BACKUP of your VMware image. – in case it wasn’t clear the first time I said it. Before you proceed you will want to make sure that you back up your VMware image. If you backup your hard drive regularly and are comfortable with your most recent restore point then this step can be bypassed. If you don’t have a disaster recovery plan in place for your hard drive, I suggest you copy the entire folder containing your virtual machine to an external hard drive. It may not be the best solution but it is better than nothing. Disclaimer: If you have sensitive information contained within your guest OS, please make sure your backup is secured in a manner that meets your company policies. If your host system hard drive is encrypted, copying the VMware image to an non-encrypted external hard drive will likely produce a non-encrypted backup. This will display a pop-up window that allows you to specify the maximum disk size for the virtual machine. Take note on the previous screen that the system capacity is also given. The last thing you want to do is starve your host OS for disk space. 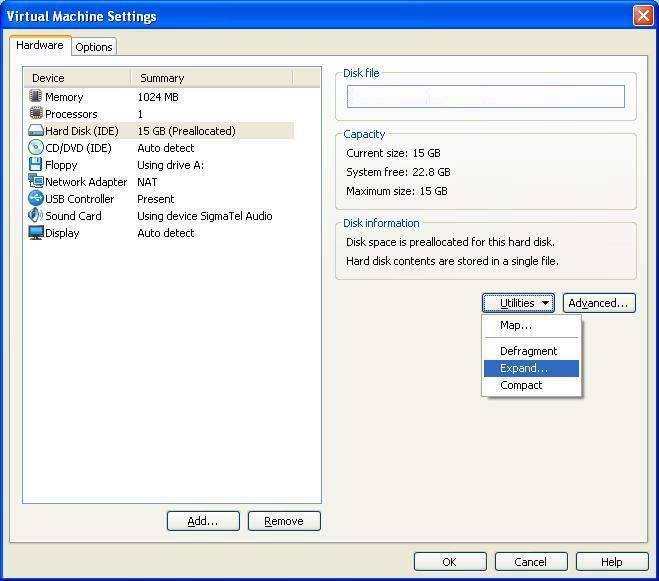 Select a size depending on your available system capacity and your individual needs in your guest OS. Once you have settled on a new size, click Expand. Once the system has completed making the adjustments you will see the following dialog window. What this is telling you is that you have modifed the size of the VMware image itself but this space will not be recognized by the guest OS until you modify the partitioning of the virtual disk and expand the virtual file systems accordingly. This is why you downloaded the EASUS Partition Master within the guest OS. If you followed the advice given in Step 0 above, then you can move on to the next step. If you skipped ahead, you may want to reconsider reading Step 0 before proceeding. Install Partition Master by simply taking the defaults. You will need approximately 75MB of free space to download and install the software on your guest OS. Once it has been installed, double-click the desktop icon to launch it. When you launch Partition Master you will see a screen similar to this. Notice the unallocated space below the primary partition. 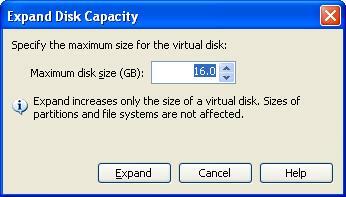 The space listed there should match with the additional space you allocated to your VM hard disk. Before proceeding make sure that you have closed any other application that may be running in your guest OS. With the primary partition highlighted, as it is in the image, click the Resize/Move button on the toolbar. After adjusting the unallocated space the dialog window should look similar to this. From here you can click OK to return to the main screen. Now that we are back to the main screen, notice how there is 1 Operation Pending (See the lower left of the screen) and the Unallocated space beneath the primary partition is no longer there. 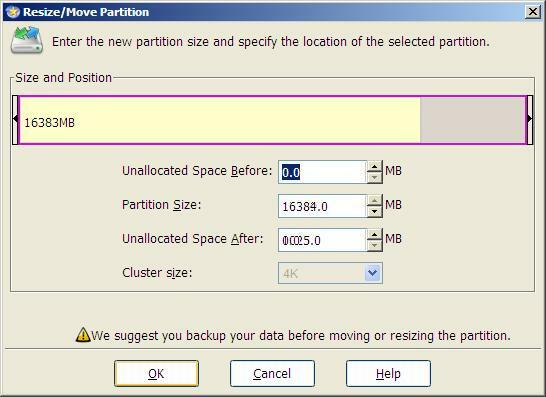 If you did not allocate all of the space to the primary partition then you will still see the remainder of the unallocated space here. If you are satisfied with the changes you have made and the backup of your VMware image, click the Apply button. Otherwise, you can still back out by clicking Undo. Assuming you have clicked the OK button, you will see the following dialog. Because of the inherent risk of working with your partition table you still have one parachute left if you want to bail out. Click Yes to proceed. While the changes are being applied you will see a screen similar to this. Depending on how big of a partition adjustment you are making this may take a few seconds or a few minutes. If you suffer from NADD, you’ve probably already context switched over to Twitter, Google Reader, or Facebook. Partition Master will let you know when it has finished and you should see a dialog window similar to this. Click the OK button to proceed. If you did not select shutdown computer after changes are applied, you should be returned to the main window of Partition Master. At this time you should close Partition Master and shut down your guest OS. Windows is going to detect that the volume has changed and you will likely see the following message. If it doesn’t appear before you shutdown you may see it the next time you log into your guest OS. If you do, restart and when you log in the next time you should be all set. Congratulations! You’ve successfully resized your partition. Now you can go ahead an install that software you need to do your job and get back to work.